To measure the English ability of immigrants in the United States, researchers often rely on the opinion of the immigrants themselves. For example, the Census Bureau asks foreign-language speakers, "How well [do you] speak English?" and gives them four choices: "very well", "well", "not well", or "not at all". Answers are highly subjective, as speaking English "well" might mean anything from basic comprehension to near fluency. 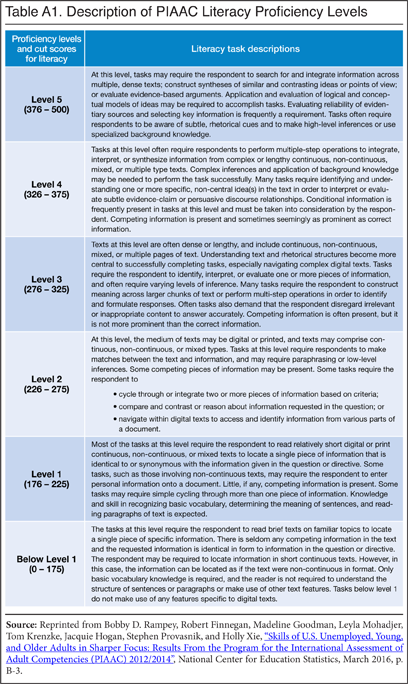 For objective data, this report turns to a direct test of English literacy administered by the Program for the International Assessment of Adult Competencies (PIAAC). The results raise concerns about the magnitude and persistence of low English ability among immigrants. 41 percent of immigrants score at or below the lowest level of English literacy — a level variously described as "below basic" or "functional illiteracy". The average immigrant scores at the 21st percentile of the native score distribution. Hispanic immigrants struggle the most with English literacy. Their average score falls at the 8th percentile, and 63 percent are below basic. 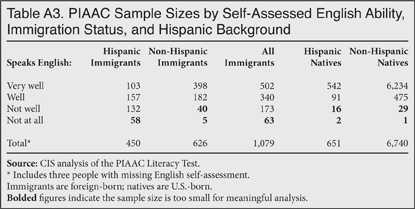 For Hispanic immigrants, self-reported English-speaking ability overstates actual literacy. The average literacy score of Hispanic immigrants who self-report that they speak English "very well" or "well" falls at the 18th percentile, and 44 percent are below basic. Even long-time residents struggle with English literacy. Immigrants who first arrived in the United States more than 15 years ago score at the 20th percentile, and 43 percent are below basic. Literacy difficulties brought by low-skill immigrants persist beyond the immigrant generation. The children of Hispanic immigrants score at the 34th percentile, and 22 percent are below basic. In addition, just 5 percent of second generation Hispanics have "elite" literacy skills, compared to 14 percent of natives overall. Without a strong command of English, immigrant families will struggle to succeed in the mainstream of American life. How then does immigrant literacy compare to the literacy of native speakers? Unfortunately, answers to survey questions on English ability can be vague and subjective. For example, when the Census Bureau conducts the annual mini-census called the American Community Survey (ACS), it asks all respondents who speak a foreign language at home "How well [do you] speak English? "1 Respondents have four choices: "very well", "well", "not well", or "not at all". Answers are based entirely on the opinions of the respondents, not on any objective measure of their abilities. The information conveyed in Table 1 is limited, however. Depending on context, speaking English "well" might mean anything from basic comprehension to near fluency. Moreover, speech is only one aspect of English ability. The ACS has no data on reading and writing skills, which are the traditional foundations of literacy. To better understand English ability among immigrants, this report analyzes scores on a direct test of English literacy given to a representative sample of Americans. Conveniently, all test-takers also subjectively rate their English-speaking ability on the same "very well" through "not at all" scale that the ACS uses. This means an actual literacy score can be assigned to people who self-identify as speaking English "very well" vs. "well" vs. "not well", and so on. 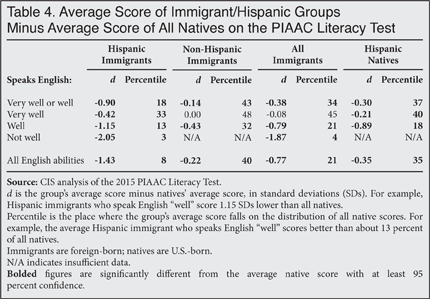 The analysis reveals that English literacy is significantly lower among Hispanic immigrants than what is implied by their answers to the ACS question on English-speaking ability. In addition, literacy struggles persist into the second generation. Definition of Literacy. Conceptually, literacy is not merely the ability to read sentences. PIAAC's definition of literacy is "understanding, evaluating, using, and engaging with written text to participate in society, to achieve one's goals, and to develop one's knowledge and potential. "5 By this definition, English literacy varies widely even among native speakers in the United States. Therefore, the literacy scores of immigrants and their children reflect more than just their adoption of English as a first or second language. Even immigrants who speak English exclusively could receive low scores on the test if their literacy skills are not well developed. Previous Research. 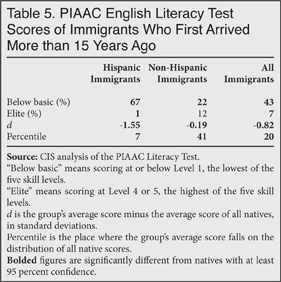 The most comprehensive analysis of immigrant performance on the PIAAC tests is a 2015 study sponsored by the National Center for Education Statistics and conducted by the Migration Policy Institute (MPI).6 The MPI study assesses immigrant skills and links them to a variety of outcome measures such as education and income. The study's main conclusion is that immigrant skills fall well short of the U.S. average, which is itself below the average in other industrialized nations. This report fills in a couple of important knowledge gaps. 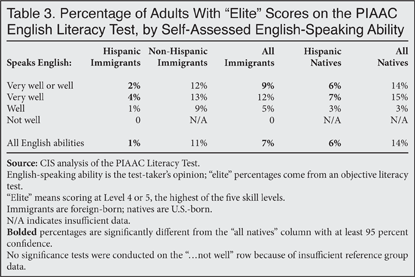 First, although the MPI authors note that immigrant literacy scores rise with self-assessment of English-speaking ability, the authors do not compare average scores at each self-assessment level with the scores of a native reference group. Only by comparing to a reference group of native speakers can we understand what it really means for an immigrant to speak English at a given self-assessment level. Second, the MPI authors show that second generation immigrants score at parity with the third generation, but they do not separate second generation immigrants by their ethnic background. Since many Latin American immigrants arrive with low levels of education, their children's scores are an indication of whether assimilation for low-skill immigrants is complete by the second generation. Below basic has sometimes been described as functional illiteracy.8 It means that a person's English does not extend beyond simple vocabulary and sentence comprehension. Tasks such as reading multiple pages, sifting through competing information in a chart, and making even low-level inferences are typically too advanced for people in this group. By contrast, elite literacy requires absorbing dense texts, synthesizing wide-ranging information, and making complex inferences. Even among native speakers, only a small percentage of test-takers have elite literacy skills. For a comprehensive description of PIAAC literacy levels, please see Appendix Table A1. Standard Deviations and Percentiles. Though easy to interpret, results based on dichotomous categories such as "below basic" tell only part of the story.9 Average scores matter as well. A perennial problem with reporting average test scores, however, is that they have little meaning without reference to the full score distribution. To illustrate, scores on the PIAAC literacy test range from zero to 500, but how much better is a score of, say, 300 compared to a score of 200? The answer depends on how spread out the score distribution is. If scores tend to bunch up in the center, then jumping 100 points could be a substantial improvement relative to other test-takers. By contrast, if scores are widely distributed, then the relative improvement from a 100-point jump would be much smaller. Table 2 reports the percentage of test-takers whose literacy is "below basic" as defined above. About 41 percent of all immigrants are below basic, with the percentage increasing as immigrants' self-reported English-speaking ability goes down. The overall figures disguise substantial differences between Hispanic and non-Hispanic immigrants. Just 23 percent of non-Hispanic immigrants are below basic, versus 63 percent of Hispanic immigrants. Furthermore, self-assessed English-speaking ability is an overestimate of immigrants' English literacy, at least for Hispanics. To illustrate, among people who say they speak English "very well" or "well", 44 percent of Hispanic immigrants and 20 percent of non-Hispanic immigrants are below basic, compared to 14 percent of natives. The sample sizes shrink when splitting up the "very well" and "well" categories, making the data less certain. However, the percentages still suggest that Hispanic immigrants (but not non-Hispanic immigrants) are more likely to score below basic than natives of the same self-assessed ability. Table 3 shows the percentage of test-takers with elite literacy skills. It is largely a mirror image of Table 2, with 11 percent of non-Hispanic immigrants and just 1 percent of Hispanic immigrants possessing elite literacy. Self-assessed English-speaking ability again overestimates the English literacy of Hispanic immigrants. Just 4 percent of Hispanic immigrants who speak English "very well" have elite literacy skills, compared to 15 percent of natives. Moving beyond categories, Table 4 reports how average scores for immigrants differ from the reference group of all natives. It provides further evidence that self-assessment overstates Hispanic but not non-Hispanic literacy. Hispanic immigrants who speak English "very well" score at the 33rd percentile, equivalent to 0.42 standard deviations (SDs) lower than natives, while non-Hispanic immigrants who speak English "very well" score right around the native average. At all levels of English ability, immigrants score 0.77 SDs below the native average, a score that places them at the 21st percentile. Again, a major divide between Hispanic and non-Hispanic immigrants is evident. The average non-Hispanic immigrant scores at the 40th percentile, while the average Hispanic scores at just the 8th percentile. Does literacy improve with time spent in the United States? On one hand, the answer would seem to be obviously yes, since English usage is so widespread, and since the benefits from learning it are so clear. On the other hand, adult immigrants usually do not attend school (where immigrant children are inevitably exposed to English), and ethnic enclaves allow some immigrants to live, work, and consume media all in their native language. Table 5 shows that immigrants who first arrived in the United States more than 15 years ago are still far more likely than natives to be below basic. In fact, there appears to be little to no literacy improvement compared to immigrants overall. Complicating the analysis in Table 5 is that new immigrants could be bringing greater skills than past immigrants did upon arrival. Indeed, the fact that immigrants who arrived within the last 15 years do not score appreciably lower on the literacy test than longer-tenured immigrants suggests they may have arrived at a higher starting point.12 Nonetheless, Table 5 still reveals an important observation: Immigrants who had poor English skills upon arrival still have poor English skills more than 15 years later. Table 6 shows that low literacy persists not just within immigrant lifetimes, but across generations as well. In this table, a second-generation immigrant is someone born in the United States with at least one foreign-born parent, while the third-plus generation encompasses people who are U.S.-born and have two U.S.-born parents. 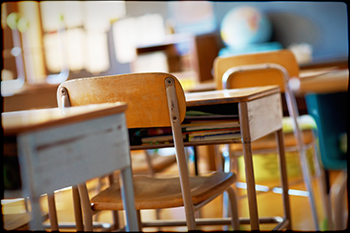 Encouragingly, below basic literacy rates fall sharply from 41 percent among immigrants to 15 percent in the second generation, bringing the children of immigrants into parity with the third-plus generation. However, the second generation still differs by Hispanic background. At 10 percent, the children of non-Hispanic immigrants are less likely to be below basic than the third-plus generation. At the same time, 22 percent of second-generation Hispanics and 24 percent of third-plus generation Hispanics are below basic. Second generation Hispanics score 0.36 SDs below natives, placing them at approximately the 34th percentile of natives. At 0.32 SDs from the mean and the 36th percentile, the Hispanic third-plus generation does little better. 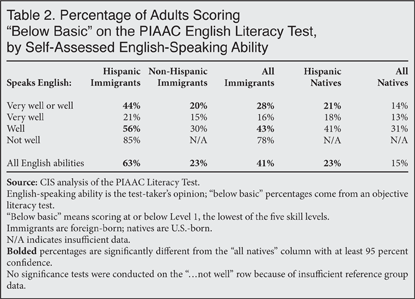 Consistent with prior analysis of the PIAAC English literacy test, immigrants score substantially lower than native speakers. Specifically, immigrants perform at the 21st percentile of the native score distribution, and 41 percent of immigrants score low enough to be described as below basic or functionally illiterate. With a 63 percent rate of below basic literacy, Hispanic immigrants struggle with English more than non-Hispanic immigrants, who have a below basic rate of 23 percent. This report reveals that Hispanic immigrants' self-assessed English-speaking ability overestimates their English literacy. Hispanic immigrants who speak English "very well" score 0.42 SDs below the native average, placing them at the 33rd percentile. Therefore, researchers should be wary of citing self-assessments as an indication of English ability among Hispanic immigrants. By contrast, non-Hispanic immigrants who say they speak English "very well" perform much closer to natives on the literacy test. This report also shows that immigrant literacy skills matter beyond the first generation. 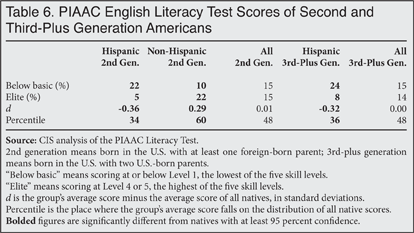 Although the literacy performance of the second generation as a whole rises to match native speakers, U.S.-born Hispanics still lag well behind other natives.13 When the United States accepts low-skill immigration, it chooses to accept a multi-generational skills deficit, with all of the socioeconomic challenges that come along with it. As noted in the methodology section, the ACS does not ask people to self-assess their English-speaking ability unless they speak a foreign language at home. Respondents who speak only English at home are typically grouped with the "very well" response, as in Table 1. In the PIAAC, by contrast, all test-takers self-assess their English-speaking ability. This is perhaps the reason that Table A2 shows proportionally fewer people in PIAAC's "very well" category. Table A3 gives sample sizes. 1 One reference person answers for everyone in the household, so the actual text of the question ("How well does this person speak English?") could refer to the reference person's husband, sister, son, etc. 2 See, for example, Dylan Matthews, "Hispanic Immigrants Are Assimilating Just As Quickly As Earlier Groups", The Washington Post, January 28, 2013. 3 Bobby D. Rampey, Robert Finnegan, Madeline Goodman, Leyla Mohadjer, Tom Krenzke, Jacquie Hogan, Stephen Provasnik, and Holly Xie, "Skills of U.S. Unemployed, Young, and Older Adults in Sharper Focus: Results From the Program for the International Assessment of Adult Competencies (PIAAC) 2012/2014", National Center for Education Statistics, March 2016, p. C-2. 4 About 2 percent of the initial sample had to be excluded from the test because of a language or cognitive handicap that prevented them from communicating their age, gender, education level, etc. (See Rampey et al., p. C-2.) The small language-based exclusion means the test probably overstates immigrant literacy to some degree. However, immigrants in the PIAAC share a very similar demographic profile with immigrants in the ACS, suggesting that the overstatement is small. (See Batalova and Fix, pp. 24-25.) Furthermore, the exclusion is bound to be concentrated among immigrants who would respond "not at all" to the question about how well they speak English. Results for Spanish-speaking immigrants (who can use the Spanish questionnaire) and for any respondents who claim at least some English ability are likely unaffected. 5 Rampey et al., p. 2. Oxford commas added for clarity. 6 Jeanne Batalova and Michael Fix, "Through an Immigrant Lens: PIAAC Assessment of the Competencies of Adults in the United States", Migration Policy Institute, February 2015. 7 PIAAC offers no simple labels for the five skill levels it identifies. This report's use of the label "below basic" for the lowest level follows from MPI's nomenclature. MPI describes Level 3 and up as "proficient", Level 2 as "basic", and below Level 2 as "low". 8 David Mallows and Jennifer Litster, "Literacy as Supply and Demand", ZfW, Vol. 39, No. 2 (September 2016), pp. 171-182. 9 For a critique of functional illiteracy as a dichotomous category, see Bryan Maddux and Lucio Esposito, "Sufficiency Re-examined: A Capabilities Perspective on the Assessment of Functional Adult Literacy", The Journal of Development Studies, Vol. 47, No. 9 (2011), pp. 1315-1331. 10 In this report, the effect size is the difference between immigrant and native scores divided by the standard deviation of the native group, not by a pooled standard deviation. This effect size calculation is sometimes referred to as Glass's delta, and it is useful when the population standard deviations of the two groups appear to be substantially different. 11 With a standard normal (bell-shaped) distribution, there is a direct link between percentiles and score differences expressed in SDs. For example, scoring 0.2 SDs above the mean has the effect of moving from the 50th percentile to the 58th percentile, while a score of one SD above the mean moves a person to the 84th percentile. The distribution of PIAAC literacy scores is not perfectly bell-shaped, however, as some very low scores pull the mean below the median. Consequently, the percentiles listed in the results section are typically one to two percentile points different from what the SDs would imply in a standard normal distribution. 12 See Batalova and Fix, p. 12, for a similar discussion of this point. 13 Third-plus generation data can be difficult to interpret due to "ethnic attrition", which is the tendency for people of Latin American descent to cease identifying as Hispanic in later generations. For a discussion of Hispanic intergenerational progress, see Jason Richwine, "Are Low-Skill Immigrants Upwardly Mobile? ", Real Clear Policy, July 8, 2015.